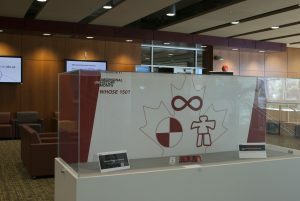 The ‘Whose 150?’ display case. The fifth annual Aboriginal (Un)History Month exhibit is now on display at UBC Library’s Irving K. Barber Learning Centre. 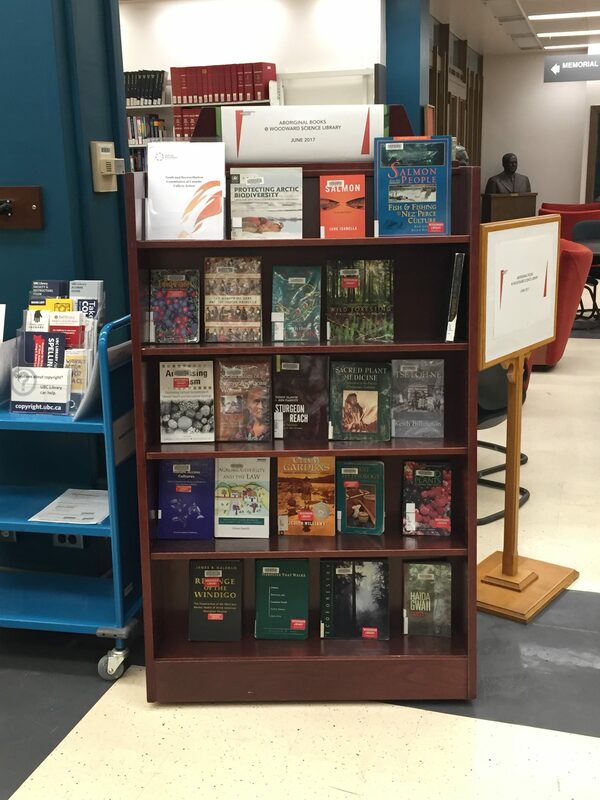 Across the nation June is recognized as Aboriginal History Month, but the tradition of (Un)History Month is a celebration and acknowledgement of the importance of Indigenous Peoples – not only in history – but in the present and future. 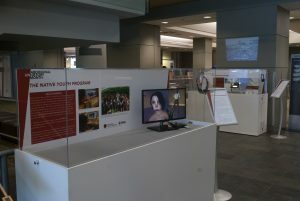 This year the exhibit asks and responds to the question “Whose 150?” with eight cases from local organizations and First Nations.  “This year, many Canadians are celebrating the 150th anniversary of Canada. For them, the development of Canada from a colony to an independent nation is the story of the emergence of a democratic nation exceptional in both its history and promise. 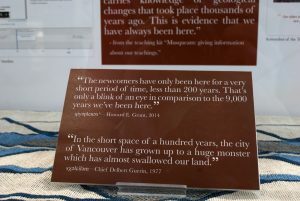 That is, however, a history that looks very different to many Indigenous people in Canada, who view the growth of the nation of Canada and its people as a story of dispossession, repression, and hardship. 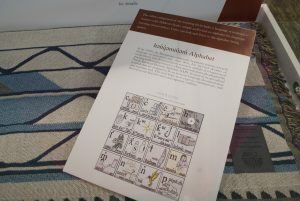 Throughout this history, Indigenous people have seen all but 0.2% of the lands upon which they have lived for millennia pass from their control, and they have seen their traditional economies, governance, and ways of life destroyed or suppressed and their basic human rights restricted or denied. For much of that history, Indigenous people in Canada could not vote, form political organizations, hire lawyers, or, in some cases, leave their tiny reserves without permission. 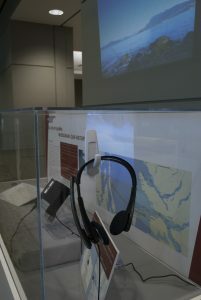 For over a hundred years, until 1996, they saw their children removed, often forcibly, from their communities and placed in residential schools designed to break their spirits and connection to their families, communities, and traditional culture, while offering them little for their future survival. Many survived horrible forms of abuse, and many died there schools, with mortality rates at times in some schools exceeding sixty percent. 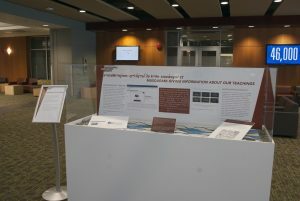 Today, many communities still struggle to contend with the aftermath of these systems and with their ongoing manifestations, and health and other outcomes for Indigenous people continue to be significantly worse than those for most Canadians, and yet, because until very recently, Indigenous people and history have been so invisible in Canadian education, few Canadians know or have a way to understand. 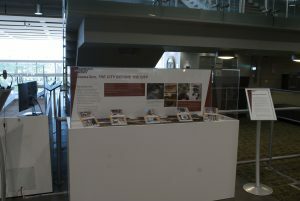 The exhibit is open from 6 a.m. to 1 a.m. on the second floor of the Irving K. Barber Learning Centre until August 30. 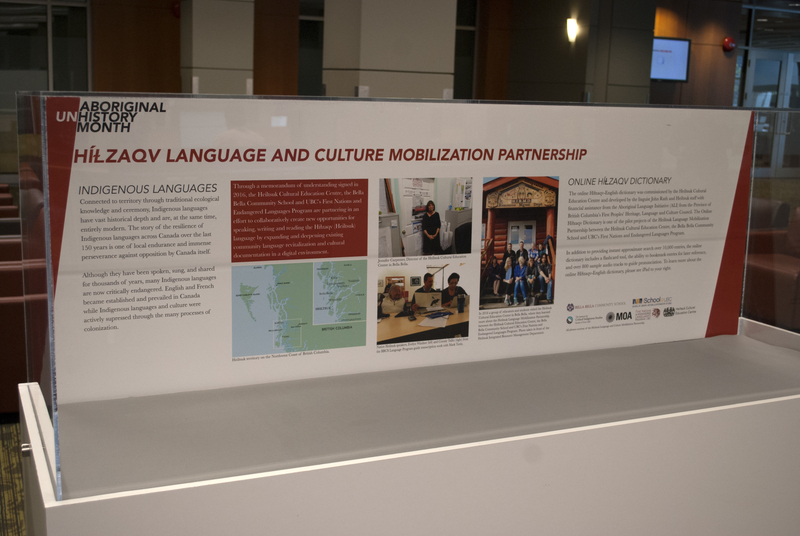 A partnership between the Heiltsuk Cultural Education Centre, the Bella Bell Community School and UBC’s First Nations and Endangered Languages Program, HLCMP creates opportunities for speaking, writing, and reading the Híɫzaqv (Heiltsuk) language. 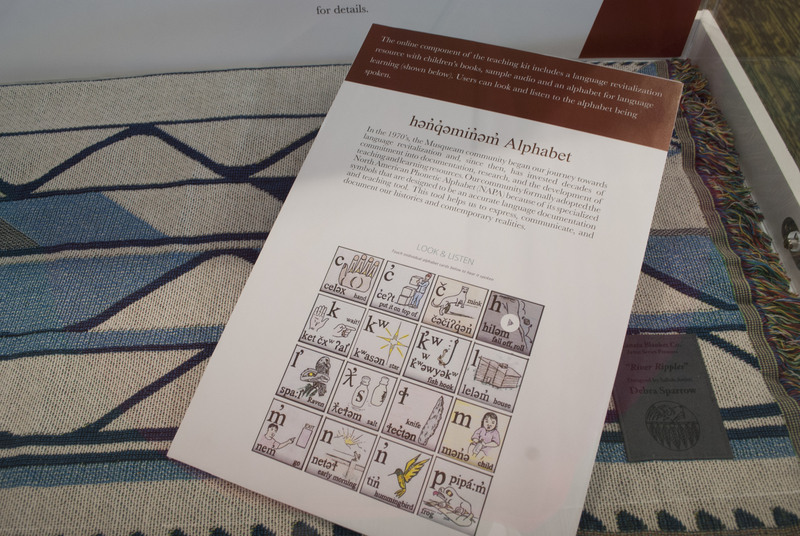 This display highlights the importance of language revitalization as a means of resilience against the legacy of colonialism. 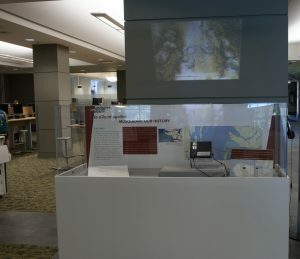 The HLCMP case, located on the 2nd floor of Irving K. Barber. The IRSHDC case addresses the nation’s history of Indian Residenital Schools which imposed the forced removal of First Nations, Inuit, and Métis chidlren from their homes and families, and sought to strip them of their language and culture. 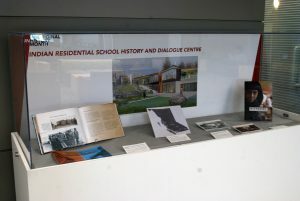 The History and Dialogue Centre -set to open its doors this summer- will hold copies of the Truth and Reconciliation Commision of Canada’s records. 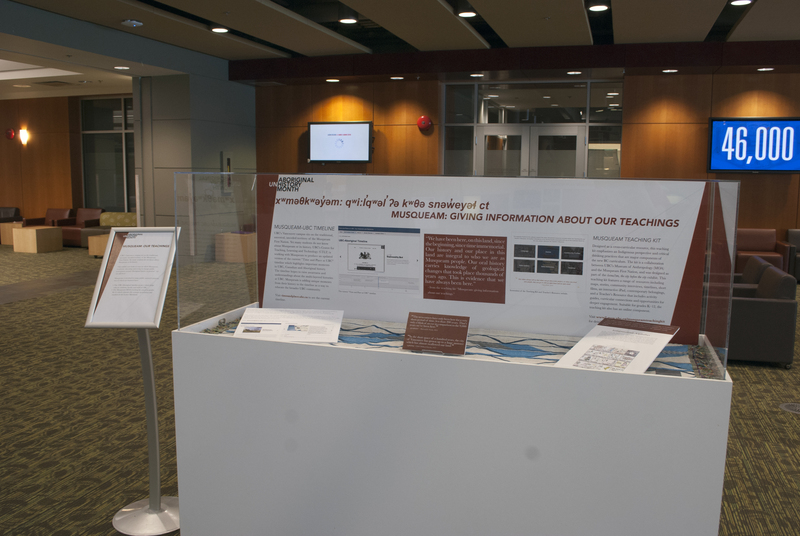 Maps and historical photos of Indian Residential Schools are some of the items on display. The Indigitization display looks at the legacy of Indigenous cultural material embedded within cassette tapes. The program offers grants to communities and organizations to support them in their digitization efforts. 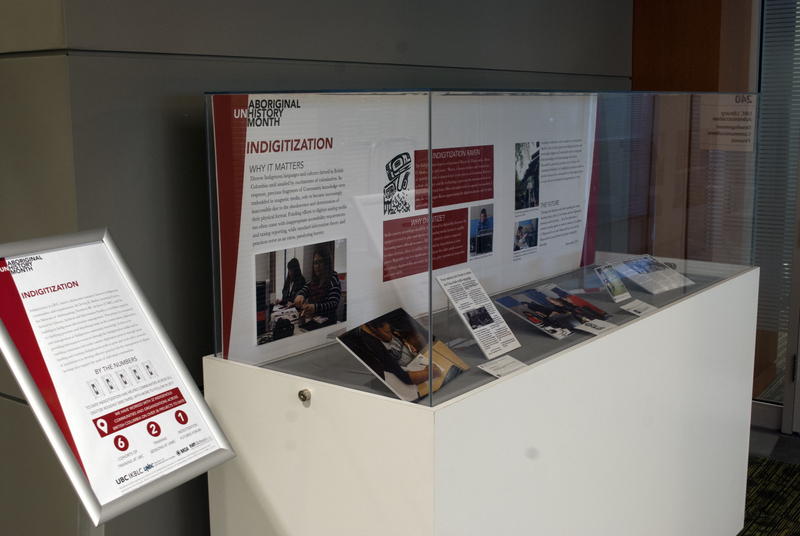 This case contains tweets, photos, and news stories relating to the Indigitization program. 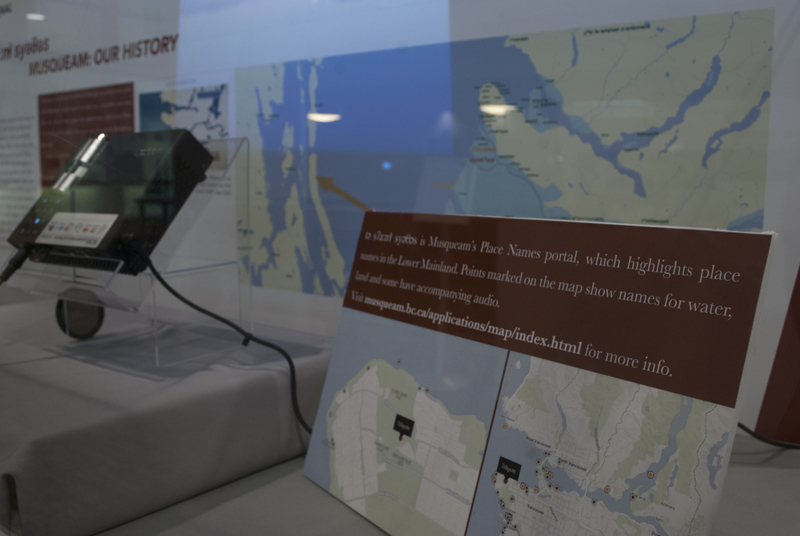 This case highlights Musqueam’s history and legacy through place names and sχʷəy̓em̓ (e.g. transformer stories), showing traditional and ancestral village sites and place names in conjunction with the current geography of Vancouver. This exhibit case looks at ways in which Musqueam is actively educating and trying to change public perceptions around Aboriginal history in general – specifically highlighting a project for the UBC community, and a project for K-12 educators and children. 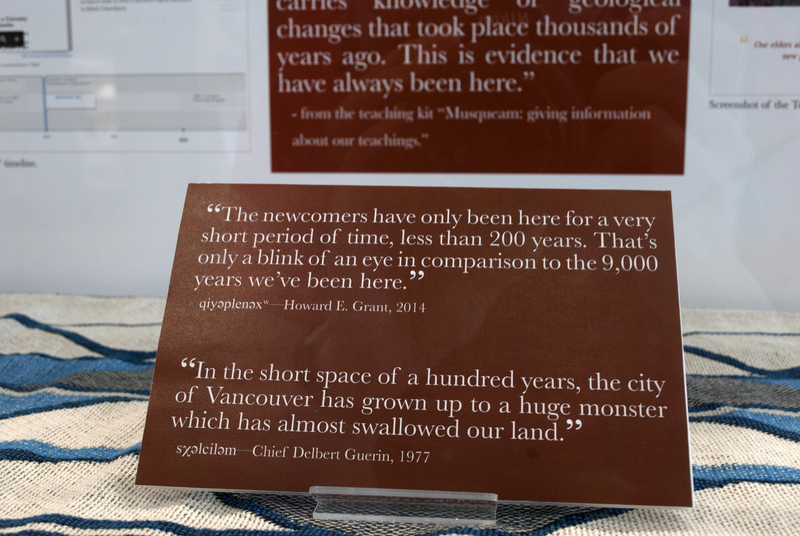 c̓əsnaʔəm, located within Musqueam’s traditional and unceded territory in what is now the Marpole neighbourhood, is an important, ancient Musqueam village and burial site. 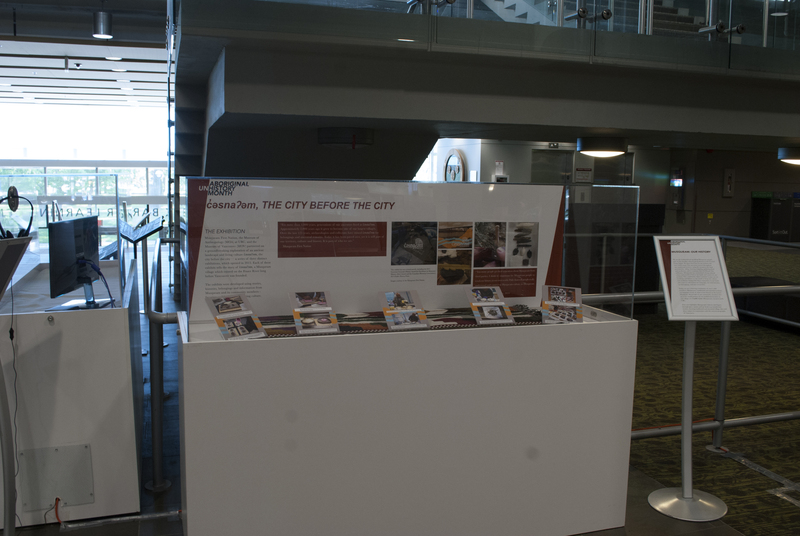 This case shows replicas of ancient belongings and the process by which these replicas and were created as part of the c̓əsnaʔəm exhibit. NYP is a summer program for urban aboriginal youth that provides training and employment for high school students. Watch and listen to two digitally animated stories interpreted and narrated by NYP members.